A gentle rocking escorts the mornings arrival. The early dawn sky is fantastic, sharing golden streaks with pink and sherbet highlights. There is a good breeze, the few clouds are moving along and the coffee really hits the spot. Above Boundary Mountain the sun peeks through the alpine timber. It is quiet in the secluded cove. But there are fish to catch and the cabin cruiser is equipped with trolling poles, multiple flashers, lures and baits of all kinds. There is room to roam on this lake. 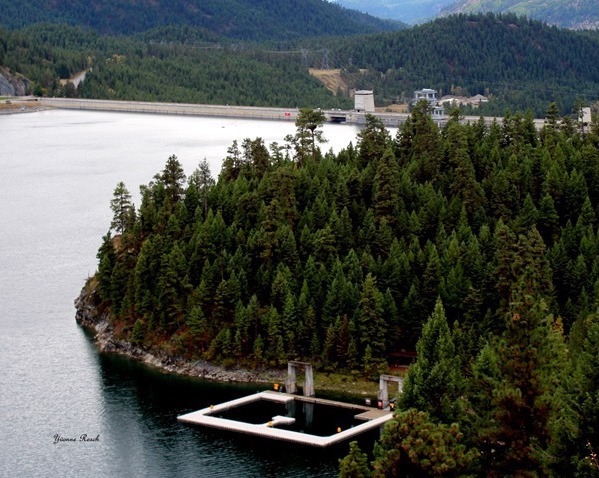 Koocanusa Reservoir begins approximately 17-miles northeast of Libby in Kootenai Country, Montana. Libby Dam backs the Kootenai River to form Lake Koocanusa which extends 90-miles upstream making it the seventh largest reservoir in the United States. About 42-miles of this water body are in British Columbia. Actually, the name derives from the combination of the Kootenai River, Canada, and the U.S.A. There are numerous camping spots along the shores. Some of the more popular listed south to north are McGillvray; Rocky Gorge; Peck Gulch; Rexford Bench; and Gateway Boat Camp. Some facilities are available at these locations. 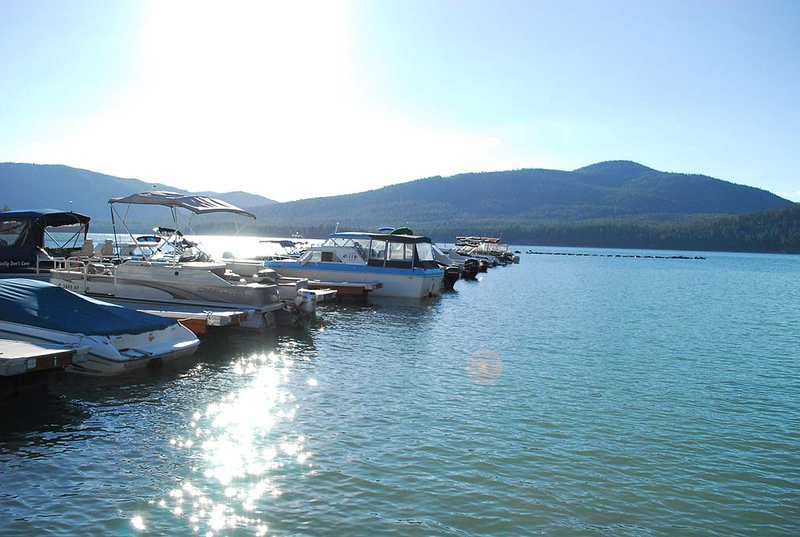 Koocanusa Resort and Marina is located 23-miles northeast of Libby and has full facilities including boat rentals, lakeside cabins, RV sites, boat launch, store, restaurant, and fishing supplies. Perhaps their most valuable asset is the true Montana Hospitality they share with all! Ask them about what’s biting, what on and where, and they will be glad to help you out. By noon, folks in deck boats, houseboats, pontoon craft, bowriders, alminum boats, jet boats and dinghies can be seen cruising, fishing and swimming. The luck is good and one can harvest some of the more popular species, Kokanee Salmon for lunch. Big Rainbow Trout give a heck of a fight! Along the sandy beach a family grills their catch and takes a few photos of a large rainbow in the arms of a happy angler. The sounds of kids laughing and splashing punctuate the mountain air. Life is good in Kootenai Country Montana. winds down through Douglas fir and ponderosa pine stands that have been selectively logged in a professional manner to decrease fire danger, enhance reproduction, and increase wildlife habitat. 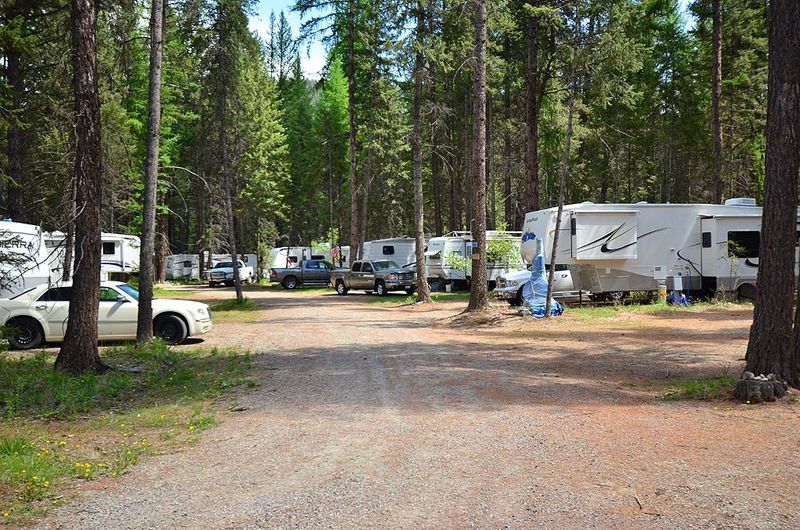 Tent and RV sites are nestled in the timber. Relatively secluded loops are arranged between scattered old horse corrals and dense stringers of shade trees. This resort seems to have all bases covered. Signs that blend with the surroundings point to the firewood, camping and picnic areas. As you continue down to the office to register, a substantial boat launch and dock is situated to the north. From this point, the vastness of the man made lake is evident. The reservoir runs some 38-or-so miles north to the Canadian border at Gateway Boat Camp. Numerous boat ramps, camping areas, points of interest, and trail head access points are located on both sides of the lake. Some of the more popular are McGillivray, Barron Creek, Ten Mile Creek, Rocky Gorge, Peck Gulch, Rexford Bench, Tobacco River and Tobacco Plains. It is important to note here that there are also numerous quiet coves and beaches that are not marked on the map for the more solitude seeking boaters. A visit to the tackle shop and grocery store provides an abundance of equipment and supplies. There is a site map on display, and the friendly staff is ready to help you with any needs including recommending the bait or lure that is working best lately. Additional literature is available if the visitor would like to explore some of the other magnificent scenery and areas around Kootenai Country! The restaurant and bar are attached to this building, and an outdoor deck with a great view adjoins the bar. The full menu season starts May first. A limited selection of choices are available year round. The Koocanusa Resort and Marina also offer cabin rentals, a studio apartment rental, condo-style living quarters, and a deluxe cabin rental. Showers, laundry, and and fuel are available on site. A variety of options exist for craft rentals including boats, pontoons, and paddle boards. There are slips and moorage available as well. Then there is the fishing! 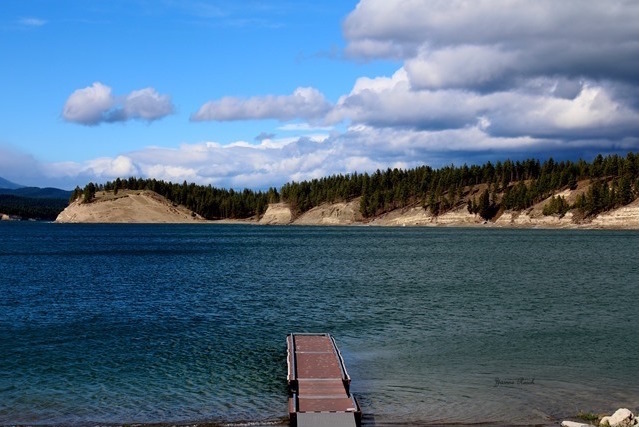 This reservoir is home to some of the best fishing in the state of Montana! It is best known for Landlocked Salmon, a variety of trout, and Ling Cod. The Annual Trout and Salmon Derby is usually the weekend after Mother’s Day, and draws between 300-500 fisher folks. Adults and kids compete for cash prizes and local business’s such as Snappy’s Sporting Goods and Dream Marine donate some really nice gear and boating equipment as door prizes. There is also a species of Bull Trout in the lake. Special regulations apply so please check the rules. Marina management does keep a firm hand on the tournaments and regulations. Mostly it encourages the participants to have a good time and catch fish! 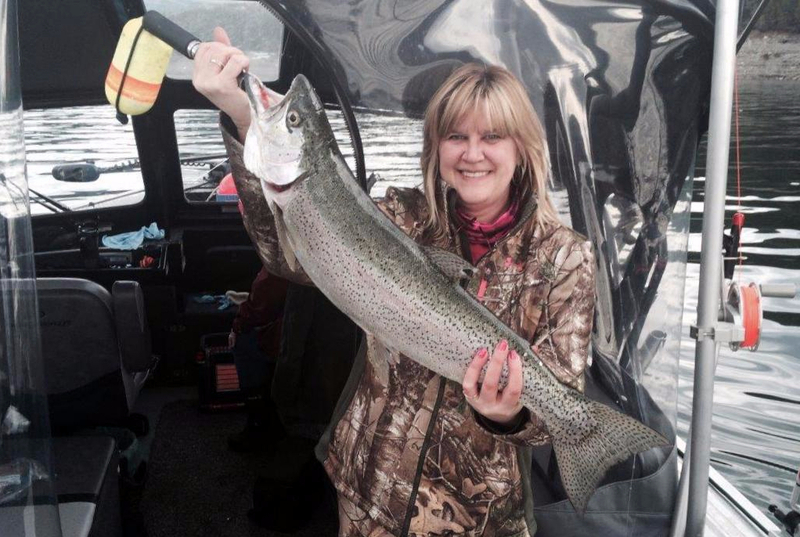 In 2014, Linda Blaisdell won this derby by catching a 9.4 pound rainbow trout, and in 2015 Troy Neater won with a 7.1-pound rainbow! Throughout the spring, summer and fall, many events center their activities at the Marina and provide an abundance of other enjoyable opportunities. Montanan’s have a great sense of humor and only in Montana could you find a "Redneck Yacht Club Race" like the one that occurs in June at the marina! No motors are allowed and the race is followed by "Redneck Meat Dish Barbecue." Bicyclists also gather from Seattle and other environs during the May-June time frame for events. The setting for these tournaments is perfect. Historically, there was a town called Jennings nearby which was a steamboat stop, and logs from Cripple Horse Creek were towed on barges to an adjacent town called Warland. The friendly owner/manager Randy ("just call me Randy") sums it all up — "There are some serious folks who know their stuff about the science and art of fishing that come here often. But we want everyone to come, relax, and catch fish.” It’s a great attitude and common in Kootenai River Country! For more information visit Koocanusaresort.com or call (406) 293-7474.